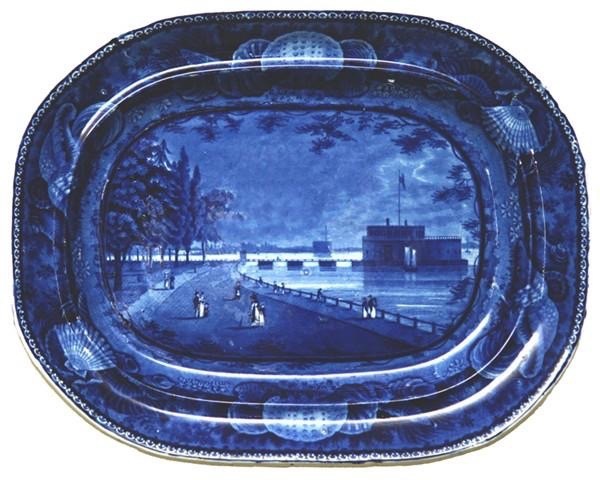 Ralph & James Clews (1814-1834) "Landing Of General Lafayette" platter. I continue to learn new things from transferware patterns. 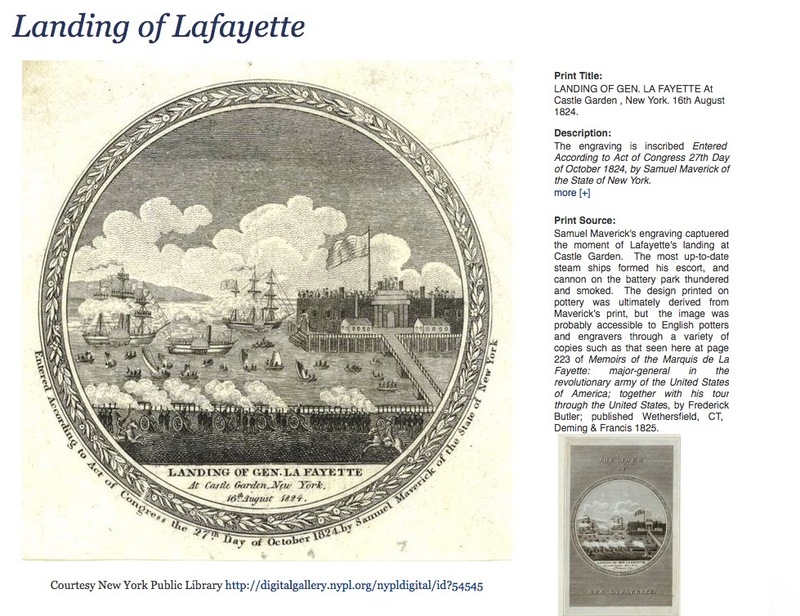 For example, I have always liked the "Landing Of General Lafayette"* pattern by Ralph & James Clews. The color is usually a clear dark blue and the image is charming and naive: boats float among cannon fire and clouds, and a large American flag flies over buildings that look as if they were drawn by a child. However, I never thought much about the second line on the front of the platter, "In Castle Garden in New York 16 August 1824," until I took a ferry to the Statue of Liberty and Ellis Island. The ferry leaves from Castle Clinton, which was named in 1817 to honor DeWitt Clinton. (Clinton was the Mayor of New York City, the Governor of New York State, and a United States Senator.) It was renamed Castle Garden in 1824 when it was used as an entertainment area. 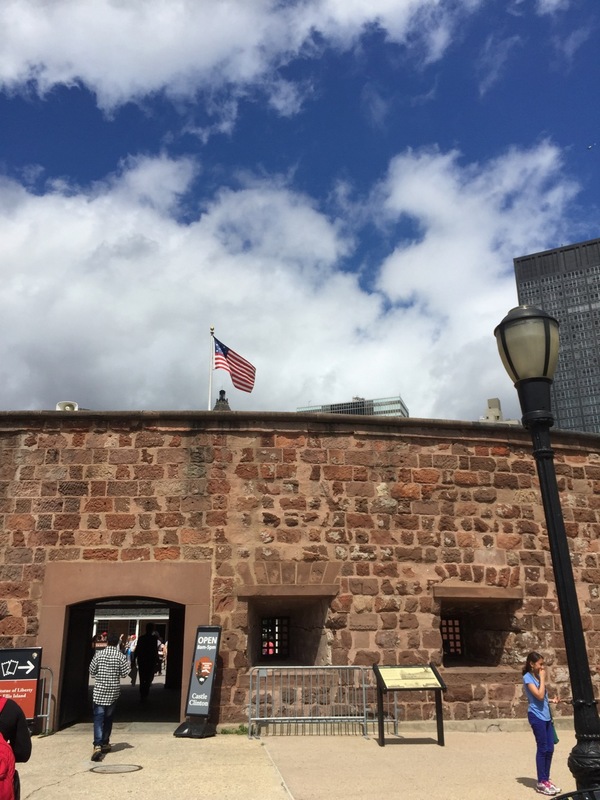 Castle Garden was the name of the fort when General Lafayette arrived in 1824 to be honored by a grateful United States for his service during the American Revolution. Castle Clinton/Castle Garden was built on an island at the southern tip of Manhattan to protect New York during the War of 1812. (You may remember that New York City was conquered by the British during the American Revolution, so the fort was deemed important for the city's defense.) 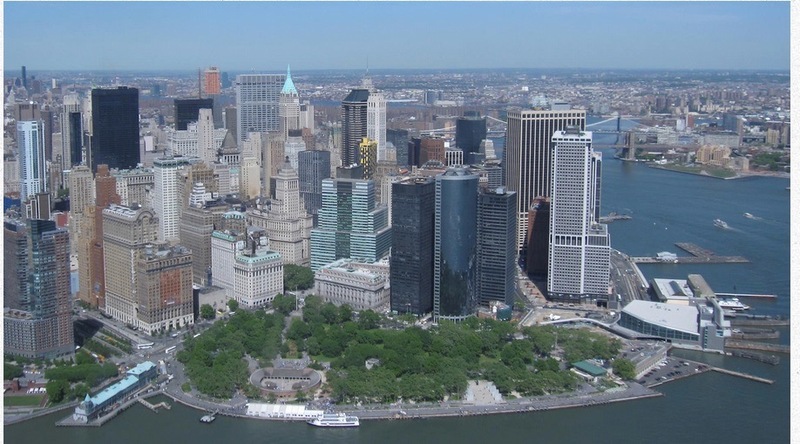 By the 1850s, Castle Clinton (no longer Castle Garden) was connected to the mainland by landfill, which created Battery Park. It was used as an immigration station from 1855 until the Ellis Island facility was built in the 1890s, and later served as the New York City Aquarium. Although a lot of the buildings that surrounded the fort have been demolished, the sandstone fort remains. Today it is part of the National Park Service, and is known as Castle Clinton National Monument. For more history about Castle Clinton, follow this link. 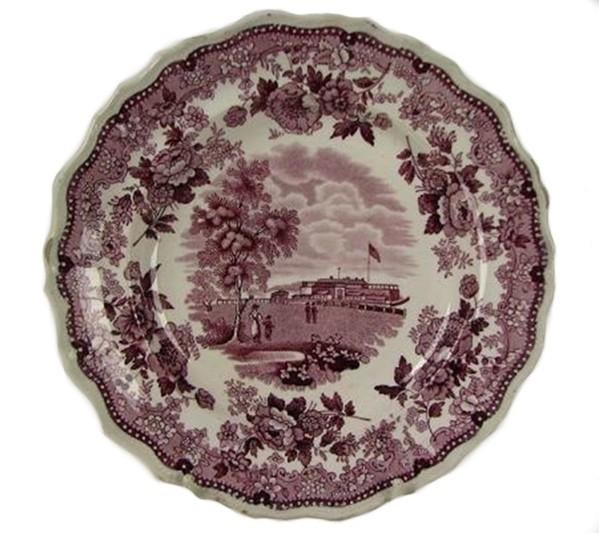 I wondered if there were other transferware patterns that feature Castle Clinton/Castle Garden, so I searched the Transferware Collectors Club Database of Patterns and Sources. It is an excellent resource. Job & John Jackson (1831-1835) "Battery & C New York." The "C" is for Castle. I thought I'd show you both an old rendering of the Castle that is part of the exhibit at the site and a modern photo that illustrates how New York City has grown around Castle Clinton and Battery Park. You can clearly see how the island was connected to the mainland by a causeway. Castle Clinton National Monument. No longer an island! Castle Clinton is on the left at the front of the photo. Here is a photo of the sandstone walls of the Castle today. It is now the Visitor Center. Although I grew up near New York and visited it many times, I never knew anything about Castle Garden/Clinton. 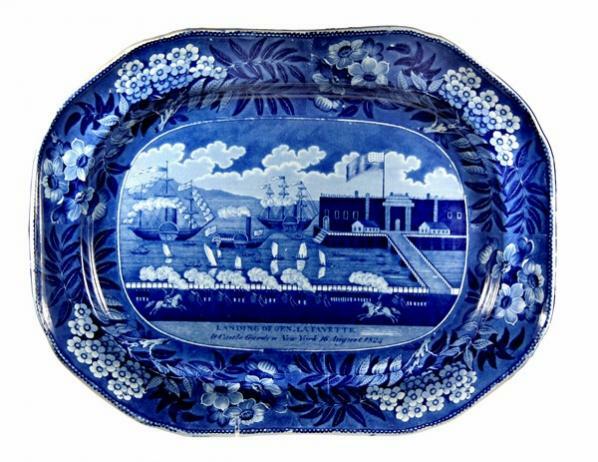 It was the connection between the "Landing Of General Lafayette" platter and my visit to Ellis Island that opened me to more history. And to more transferware historical patterns! One more photo. Below is a 3.5 inch cup plate made by Enoch Wood & Sons. You'll see that the pattern is part of the larger Enoch Wood platter above. Notice that the focus here is on Castle Garden/Clinton. Enoch Wood & Sons (1818-1846) 3.5 inch cup plate known as Castle Garden Battery, New York. One more thing, here's some information about the source print for "The Landing Of General Lafayette" pattern. I found it in the Transferware Collectors Club online Exhibition titled "Patriotic America." 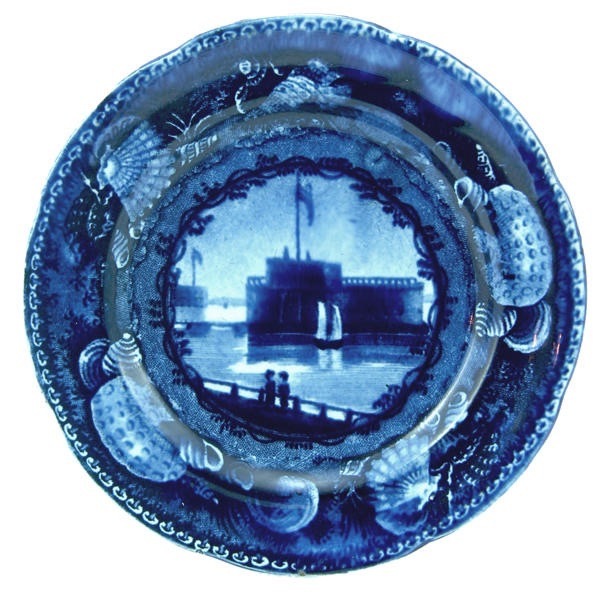 If you like transferware, you might want to look at this free website. And, thanks to the New York Public Library for the image. *General is abbreviated on the platter as Gen. Also note the different spelling arrangements of Lafayette's name. Sometime it is "La Fayette" and sometimes it is "LaFayette." I used Lafayette. You may have a favorite spelling.